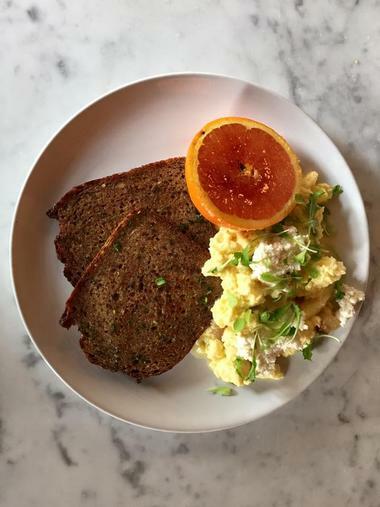 Whether you are visiting for work or play, there is never a dull moment in Pittsburgh, and you are going to need a good breakfast to set you up for the day ahead. 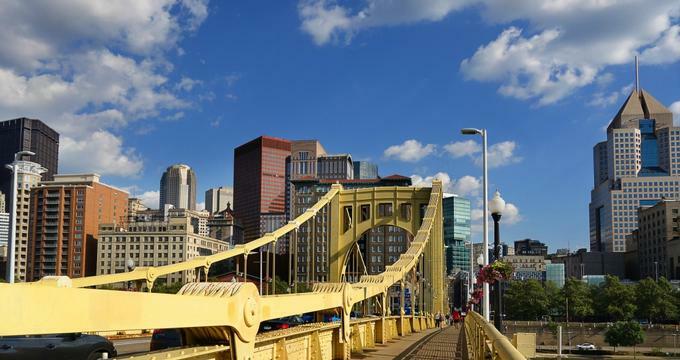 Pittsburgh offers an amazing choice of restaurants serving just about every style of breakfast you can imagine, from family-run old-style diners to creperies and waffle shops. Grab-and-go kiosks rub shoulders with elegant and innovative modern establishments to ensure that no-one goes hungry. 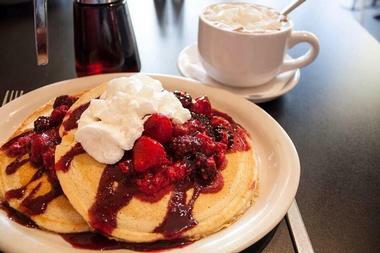 Pittsburgh’s famous Strip District and Downtown probably have the greatest concentration of eateries, and there are several great options for breakfast tucked in among the old-style grocers and gourmet food stores that line Penn Avenue. Braddock’s is a popular local eatery with a great atmosphere, serving up an excellent breakfast every day from 7am to 11am. If you just need a quick, healthy start to your day you can order their continental breakfast, which features fruit juice, your choice of fresh fruit or cereal, and two pastries served with coffee or tea. If you need something a little more substantial, you can consider a BYO (build your own) three-egg omelet, eggs to order with your choice of accompaniments, or a delicious Braddock’s Benedict with grilled kielbasa. 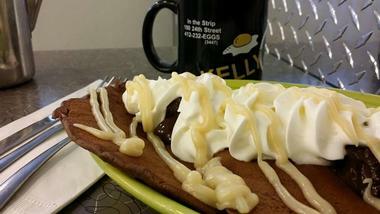 A selection of sweet treats including Belgian waffles, pancakes, and French toast are also available from the griddle. Café Moulin is a French-inspired café and creperie which is open daily from 8am to 4pm, serving a good variety of French-style breakfasts and brunches. The café has a few light and healthy options on the menu including fresh fruits, yoghurt and granola, and a fruit parfait, but their main claim to fame are the delicious French toast platters and a selection of sweet and savory crepes. Their delicious French toast is made with egg-soaked brioche served with maple syrup, banana, and crisp bacon (three other variants are available). You can also choose from a selection of panini or opt for your favorite sweet or savory crepe. 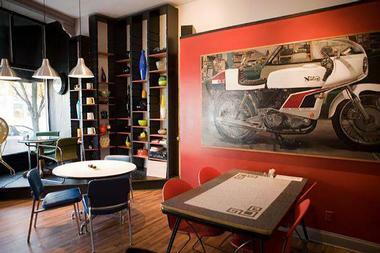 Café Raymond is a small family-owned eatery situated in the Strip District of East Pittsburgh. What separates this little café from the rest is the chef – Chef Ray takes great pride in serving fresh, made-from-scratch dishes using the finest locally sourced ingredients he can lay his hands on. 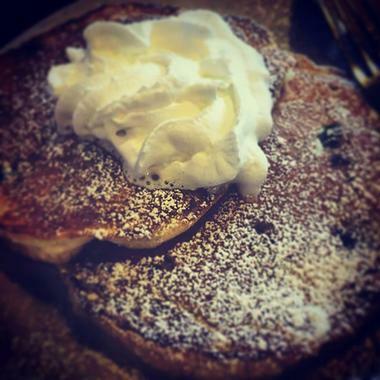 All the bread is made on the premises, and the blueberry pancakes are rumored to be the best in the city. There is always a tasty quiche of the day and several other breakfast/brunch favorites are on the menu. The service is quick and friendly and you will be surrounded by locals – always a good sign. 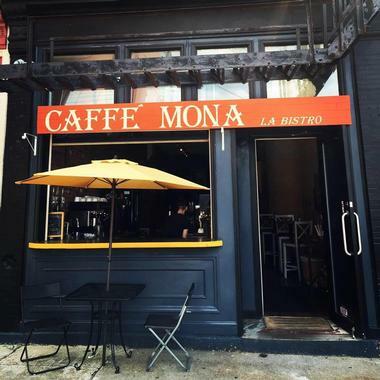 Conveniently situated right on Penn Ave, Caffé Mona is a well-respected bistro that serves great breakfasts and brunches seven days a week. The delightful flower-filled deck is the ideal place to enjoy your breakfast on a lovely day, but inside seating is also available. The café serves a good selection of both sweet and savory crepes with some innovative fillings such apple and brie, the Mr. Green (spinach, feta, mozzarella, and Asiago), and the Turkey Blue (turkey, ham, melted brie, and mustard sauce). In addition, the menu features omelets, French toast, eggs to order, bagels, salads, and sandwiches for brunch. Open seven days a week from 7am to late, the Central Diner and Grill is a family-run eatery that prides itself on serving excellent quality food in a family-friendly venue with great atmosphere. You can start off with some fresh fruit juice and a bowl of yoghurt with fruit or oatmeal with milk or go straight for one of the traditional cooked breakfast favorites. The omelet menu includes something for absolutely everyone and includes Greek, Italian, salmon, and vegetarian options, or you can order eggs the way you like them accompanied by a wide selection of delicious sides. The griddle choices include pancakes, Belgian waffles, and French toast. Coca Café is a great choice for breakfast from Tuesdays to Saturdays and for a lovely, lazy brunch on Sundays. The food is decidedly different from your mainstream breakfast eatery and there are many interesting new taste sensations to sample, like sourdough toast with Monkey Butter (pineapple, coconut, and banana) or crispy Brussels sprouts served with a balsamic reduction and shaved Reggiano. Vegetarians are particularly well catered to with more substantial dishes like a delicious tofu scramble served with spinach, mushrooms, or shakshuka eggs with melted feta. Carnivores have not been ignored and there is a good variety of burgers and brunch meats served with eggs to order. 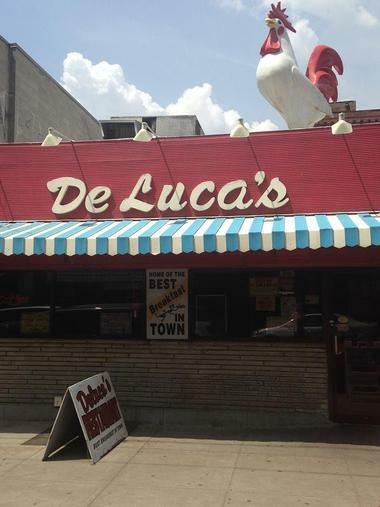 If you are planning to explore Pittsburgh’s famous Strip District, DeLuca’s Diner is an ideal place to visit for breakfast or brunch (served daily from 6.30am to 2.30pm). The restaurant prides itself on serving freshly prepared food using many ingredients sourced from local Strip District merchants. You can stick to the basics and order eggs the way you like them, served with a variety of tasty sides, or be really extravagant and order the signature DeLuca’s Seafood Omelet filled with lobster, crab, shrimp, cheese, and hollandaise sauce. A selection of “Eggceptional” sandwiches, breakfast burritos, fabulous Benedicts, and sweet treats (French toast, pancakes, and waffles) complete the picture. 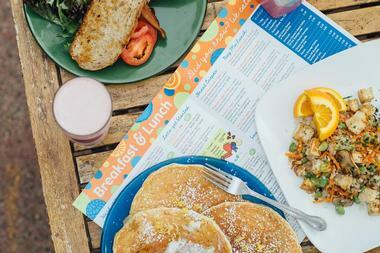 Occupying the prime position on the menu at Eggs-R-Us, fresh and tasty egg dishes of all descriptions have made this eatery a popular choice for breakfast and brunch in Pittsburgh. Egg lovers will find all their favorites on the menu, alongside a variety of interesting dishes with innovative twists. You can build your own omelet, savor the Country Style Steak Platter (steak with sausage gravy, two eggs, potatoes, and toast) or enjoy a spicy breakfast burrito with sour cream and salsa. 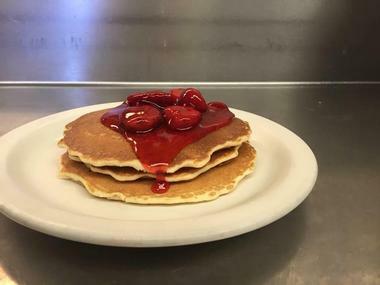 The griddle menu offers a good selection of pancakes, French toast, and waffles for those with a sweet tooth, and if you need something more “lunchy,” you can order burgers, salads, sandwiches, and wraps. 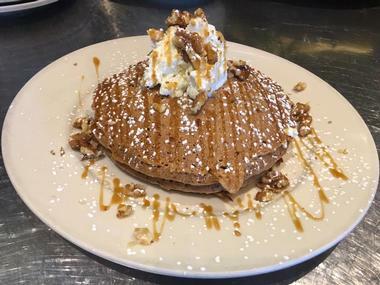 Situated in an inviting industrial/chic venue in Lawrenceville, Geppetto Café offers visitors an amazing variety of interesting sweet and savory crepes, waffles, and French toast dishes. Vegetarians are very well catered for with several interesting and completely meat-free savory crepe fillings – try the Italian Job, Super Veg, or Bella Crepe. Sweet fillings include delicious banoffee (banana, toffee and cream), brie and walnuts, and the Geppetto Signature – filled with caramelized apples, caramel, and cream cheese. If you are not into crepes, you can choose a tasty French toast, sandwich, salad, or panini, all washed down with your favorite coffee, tea, milkshake or smoothie. 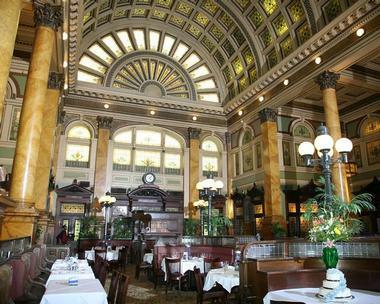 Set against the impressive architectural backdrop of the 1901 Pittsburgh & Lake Erie Railroad Station, the Grand Concourse Restaurant is famous for wonderful seafood and a very impressive Sunday brunch, which is served from 11am to 3pm every Sunday. The all-you-can-eat brunch is served buffet style, featuring a very impressive selection of tasty dishes set up in the former waiting room of the elegant building. You need to bring a big appetite – you will find an omelet bar, egg dishes, several types of salmon and other fish, a selection of salads, and a carving station. You can round off your meal with large selection of muffins, cakes, cookies, and other tempting desserts. Kelly O’Connor started Kelly O’s Diner back in 2001 and over the last 17 years the diner has attracted a faithful following of regulars who come back time after time for satisfying comfort food and good service. Whether you are exploring the Strip District or visiting North Hills, you should make a point of stopping in for a hearty breakfast or Sunday brunch. The diner serves up all the regular breakfast choices with a good selection of side dishes and a few fancier options –try the delicious omelet with a crab and asparagus filling with creamy hollandaise. The French toast (made with homemade raisin bread) and is a perennial favorite among the regulars. You will find Lindos Greek/American restaurant in the heart of Pittsburgh’s North Side Historic District. Lindos opens at 6am every day of the week, which makes it an ideal place to enjoy a good breakfast before you set off to explore the local attractions. At Lindos you can choose from an extensive egg menu (accompanied by regular or turkey bacon, sausages, sausage patties, and fries) or indulge in a delicious omelet with a large variety of fillings, including their signature Lindos Greek Omelet, filled with spinach, feta, and gyros meat). Breakfast dishes are served all day long together with bottomless coffee. At Micro Diner in Mount Washington, eggs are never out of fashion and you can enjoy your favorite breakfast at any time of the day. 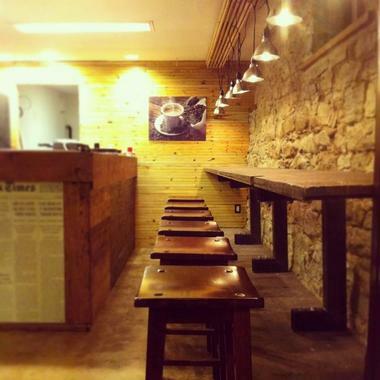 Micro Diner is open daily and prides itself on serving freshly made food in a comfortable and attractive setting. The breakfast menu features a wide selection of eggs to order, including delicious three-egg omelets with fillings that are sure to be a hit with both vegetarians and carnivores. You can personalize your meal by adding your choice of delicious side dishes, including several types of bread, muffins, and bagels, and you can even order gluten-free pancakes. Nadine’s Restaurant and Bar is a family-run establishment that has been welcoming visitors to the Southside for over 16 years. 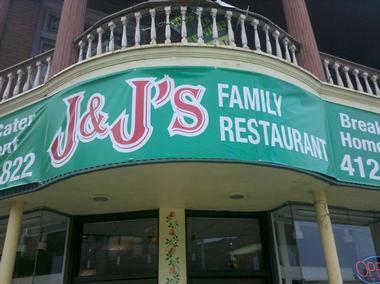 The restaurant offers a very congenial atmosphere and freshly prepared breakfasts, lunch, and snacks at reasonable prices. Breakfast dishes are served from 6am to 11am on weekdays and from 9am (10am on Sunday) to 1pm on the weekend. You can tuck into a delicious breakfast hoagie, try an English muffin or bagel sandwich, or keep it simple and order eggs the way you like them served with bacon, sausage, or ham. If you fancy something more substantial, you can choose from a good selection of sandwiches, soups, and salads served from 11am onwards. You can get your visit to Pittsburgh’s famous Strip District off to a great start by popping into Pamela’s Diner for a hearty breakfast. Pamela’s has been pleasing Pittsburgh palates since 1980 and the chain now has a total of five venues dotted around the city. You will find all the usual egg dishes on the menu, alongside some of Pamela’s signature specialties that have been bringing the regulars back time after time. 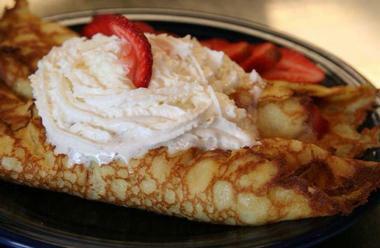 You can try Pamela’s Famous Crepe-Style Hotcakes, served with either savory meat sides or decadent sweet fillings with berries, bananas, and more. Omelets are available with a variety of fillings and you can also opt for California French toast, croissant French Toast or a delectable Belgian waffle. 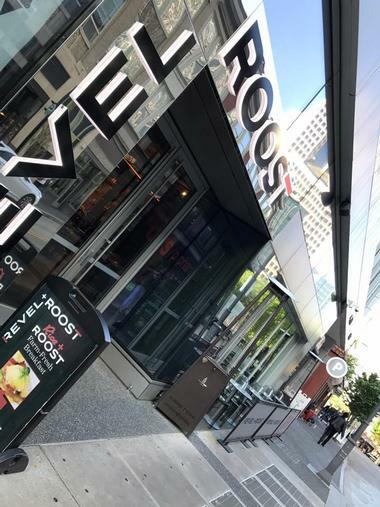 Centrally located on Market Square in Downtown Pittsburgh, Revel and Roost is spread over two floors; on the upper level you will find Roost, where you can enjoy breakfast, lunch, and dinner in a refined and comfortable setting. 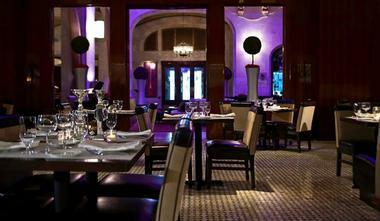 Revel, on the lower floor, offers all-day lunches and a great Sunday brunch served from 10am to 2pm. If you are visiting for a Roost breakfast, you can enjoy eggs to order with your choice of sides or tuck into a frittata, quiche, or a traditional Benedict along with pancakes, waffles, and French toast. The Sunday brunch menu offers a smaller selection of signature dishes such as chicken and waffles, pork hash or breakfast pizza with a selection of side dishes. Ritter’s Diner is a nostalgic, old-fashioned, family-run diner that first opened its doors in 1951 and is still going strong. 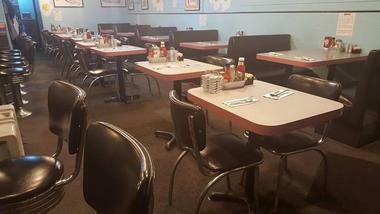 The diner serves all the regular breakfast dishes everyone loves to eat, including eggs cooked to order, a variety of omelets, and a selection of tasty breakfast sandwiches. If you have a sweet tooth, you can choose something from their French toast and hotcake menu and personalize your meal from the list of side dishes. If you are visiting for brunch/lunch, there is also a selection of classic American favorites to choose from, including fried green tomatoes, meat balls, burgers, and salads. Square Café is conveniently located on Regent’s Square and is dedicated to offering guests a tasty and nutritious made-from-scratch meal using the finest fresh seasonal produce. The breakfast menu is fresh and innovative, offering all the old favorites alongside interesting vegetarian, vegan, and gluten-free options. A few of the specialties include the Brussels sprouts bowl (creamy grits, shaved Brussels sprouts, leeks, bacon, mushrooms, and egg) and the ahi tuna bowl (tuna, quinoa, and Asian vegetables). There are plenty of omelets, crepes, and pancakes on the menu as well as healthy smoothies and a fascinating naan croque monsieur. 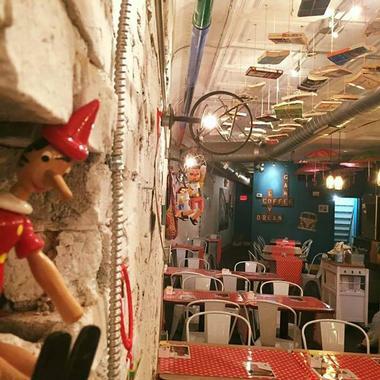 Square Café also showcases local artists so that you can enjoy your meal surrounded by lovely works of art. The Bistro is a popular meeting place and breakfast venue located in the Marriott Courtyard Hotel in Downtown Pittsburgh. If you just want a quick pick-me-up to get you going, the continental breakfast is probably ideal, while visitors who enjoy a heartier start to the day can choose from several cooked American breakfast standbys. In addition to egg dishes you can choose several fruit and oatmeal or granola combinations, order a strawberry/banana smoothie, or sweeten your morning with thick cut French toast served with fresh strawberries and country syrup. 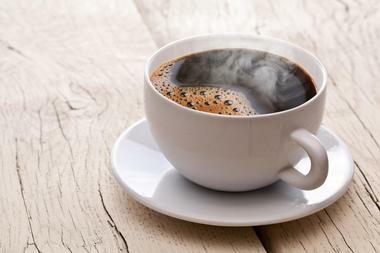 You can also choose one of your favorite Starbucks coffees to round off the meal. 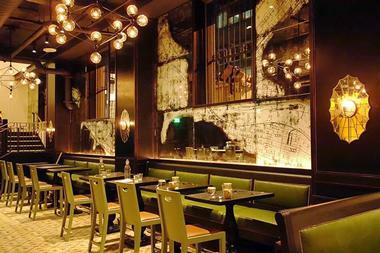 The Commoner is located next door to the Kempinsky Hotel Monaco in Pittsburgh and serves only the finest (and by no means common) locally sourced Pennsylvania food for breakfast, lunch, supper, and Sunday brunch. 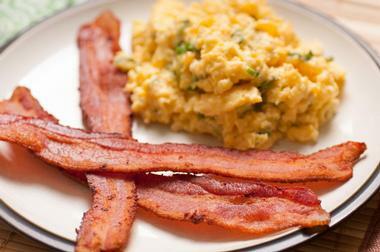 The food is fresh and innovative and features many breakfast favorites that have been given a distinct Commoner twist. For instance, they make their own delicious granola bar served with a cranberry and blood orange muffin, fresh fruit, and your choice of juice or coffee. More substantial breakfasts include omelets, vegetable crepes, and buckwheat pancakes, which you can dress up with a choice of sides. If you are in a hurry, you can grab and go at the Commoner Corner. Located in Dormont, The Dor-Stop diner is a family-owned eatery that has been serving up satisfying home-style breakfasts and lunches for over 29 years. During the week The Dor-Stop opens at 6am and offers an early-bird special – ideal for anyone who needs to be up and about really early. You can feast on steak, egg, and chips, opt for one of several takes on the traditional eggs Benedict, or choose a tasty and filling omelet of your choice. If you happen to like something sweet and decadent for breakfast, you have also come to the right place – choose from delicious stuffed hot cakes or French toast. Located in Lawrenceville, The Vandal is open daily during the week for breakfast, lunch, and dinner and serves a great weekend brunch. The innovative food is carefully chosen to showcase produce from local Pennsylvania farmers and remains true to the Hungarian chef’s Eastern European heritage. The menu is constantly changing to make the best possible use of seasonal produce, and for breakfast or brunch you will always find a number of eggs dishes alongside farm-fresh vegetarian choices such as quiche of the day served with a small side salad. To please the carnivores there are always a number of hearty meat dishes with interesting vegetable sides. When only the finest, most decadent, and absolutely genuine Liège Belgian waffle will do for breakfast, you need to make your way to Waffallonia in Squirrel Hill or Oakland. 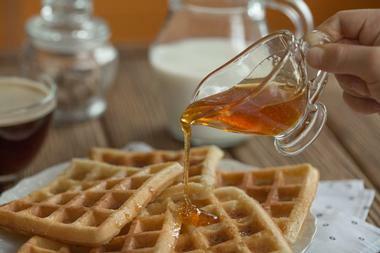 Unlike regular waffles, Liège Belgian waffles are made according to a 200-year-old Belgian recipe using special pearl sugar imported from Belgium to give a unique flavor sensation. You can eat the waffles on their own or go all out and choose one of the delicious topping combinations (each of which is named after a Belgian city), which include Nutella, whipped cream, Belgian chocolate, fresh fruit, or ice cream. Both venues offer a take-out option. Waffles are a perennial American breakfast favorite and at Waffles INCaffeinated you will find a selection of delicious sweet and savory waffle breakfasts served with an excellent cup of coffee to get your day off to the best possible start. Some of the tasty savory waffles include the Benny – a perfect half waffle topped with two poached eggs nestled on a bed of ham and crab meat and draped in hollandaise. 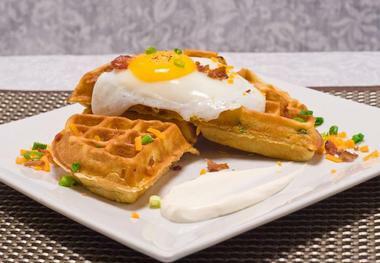 The Breakfast Magic waffle has cheese, bacon, and green onion inside and is topped with more of the same and a fried egg. Sweet waffle toppings include Funky Monkey (choc chips, banana, and peanut butter) and Megaberry – with fresh berries, vanilla bean syrup, and whipped cream.